One of the largest ski areas in Canada with light, dry powder spread across three unique mountains. Experience high quality ski in / ski out accommodation. When will it snow in Sun Peaks? The next notable snow forecast for Sun Peaks is 2cm1in, expected on 24 April, with around 11cm4in forecast over the next 7 days. How High is Sun Peaks? The Canadian Ski Resort of Sun Peaks has direct access to 80 marked pistes, served by a total of 6 ski lifts. 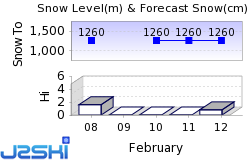 With ski lifts as high as 2,080m6,824ft, snow cover is generally reliable. Sun Peaks has grown rapidly to become one of Canada and the world's leading resorts. The resorts has expanded dramatically over the past decade with more than $500m invested, strengthening its appeal as the major four-season destination resort in the interior of British Columbia. With around 4,000 acres of terrain, this is now Canada's third largest ski area. The resort has built its reputation on a combination of first class service, state-of-the-art facilities at the base of the mountain, superb skiing over a large ski area - now covering three mountains - blessed with an average 559cm (220 inches) of light dry powder in an average winter and somehow finding time to fit in 2000 hours of sunshine annually too. Much of the resort itself is brand new and all the lodging is slopeside too. Sun Peaks was originally called Tod Mountain when it was established in 1961. The resort was purchased by Nippon Cable in 1992, and renamed as part of an extensive resort development plan. The main ski mountain remains 'Tod Mountain'. The name Tod came from a famous fur trader, John Tod, who was a chief trader for the Hudson's Bay Company in the early 1840's. The longest possible descent in Sun Peaks is 8km5 miles long and the most difficult run is the 'Challenger', which is 2km1 miles in length. Sun Peaks has three mountains to enjoy. The original and highest is Tod, which offers a wide range of runs above and below the treeline. There's something for everyone, from fast long blue and green cruisers up to steep sharp blacks like Bluff, Intimidator and the 2km (1.25 mile) long Challenger; with everything in between, particularly glades. The trails are served by a high speed chairlift network and Sun Peaks has a reputation for immaculate slope grooming. The top of the mountain has open bowl skiing and there's back country cat skiing just over the ski area boundary. Next to Tod sits Sundance Mountain, home to some of the best groomed runs and terrain parks for children and beginners. The resort opened its third mountain, Mt. Morrisey, for the 2001-2 season. Mt. Morrisey's 1378ft / 420 m vertical compares favourably with Sundance Mountain across the valley and offers spectacular vistas of Top of the World Mountain at 6824ft / 2080m. Mostly north facing, Morrisey is already famous for its dry powder and glade or tree skiing. Skiers and riders can enjoy the thrill of descending through open forests, but on groomed pitches a treat traditionally reserved for advanced enthusiasts. In order to make the most of this huge choice you may wish to take a free tour of the mountain first thing in the morning or after lunch with Sun Guides; you also have the opportunity to ski with Canadian Olympic Champion Nancy Greene. Sun Peaks is also one of the world's few speed skiing centres. Racers use The Headwall track which is fully accessible by two chairlifts with a mid-mountain restaurant next to the finish area for viewing. The track is a steep technical speed course on which racers go from zero km/h to 170 km/h in 8 to 10 seconds. If you like your skiing a little slower and flatter, check out the 40km of groomed cross country trails. When is Sun Peaks open? We don't currently have confirmed season dates for Sun Peaks. Usual opening is late November, and usual closing is Early April. NOTE:- Lift and Piste openings are always subject to Snow Conditions in Sun Peaks. Sun Peaks is able to make snow, on 3km2 miles of ski runs, with 21 snow cannons. The six ski lifts of Sun Peaks are able to uplift 7,263 skiers and snowboarders every hour. Sun Peaks is in Thompson-Nicola P, Thompson-Nicola, Canada. The nearest airports to Sun Peaks are Kamloops and Kelowna, all within three hours drive. Kamloops is just one hours drive away, in good driving conditions, so you can be on the piste quickly. The resort has a selection of bars and restaurants, mostly centred on the main hotel complexes. The resort's nightclub, Club Mackdaddy's, was awarded Best New Night Club Sound System in North America by the National Association of Music Merchants at the International Trade Show in Anaheim, California. Scott McDonnell, part owner of the new club said Our Jazz and Blues nights are when you can really appreciate the systems quality. The 1.2 million dollar night club is located in the Delta Sun Peaks Resort. Sun Peaks also has a weekly events calendar which includes activities which include casino night, bonfires and torchlit descents. Want to Know when it Snows in Sun Peaks? Click above to get Snow Reports by e-Mail for Sun Peaks. By doing so, you agree to Our Rules. Other popular Ski Areas near Sun Peaks. Popular Ski Areas in Canada. Want to ask about skiing and snowboarding in Sun Peaks? Or contact Sun Peaks Tourist Office. Note :- The information on J2Ski concerning Sun Peaks, where not clearly factual, is opinion only and is neither definitive or exhaustive.